In Ultimate Event Theory (UET) the basic building-block of physical reality is not the atom or elementary particle (or the string whatever that is) but the ultimate event enclosed by a four-dimensional ‘Space/Time Event-capsule’. This capsule has fixed extent s3t = s03t0 where s0 and t0 are universal constants, s0 being the maximum ‘length’ of s, the ‘spatial’ dimension, and t0 being the minimal ‘length’ of t, the basic temporal interval or ksana. Although s3t = s03 t0 = Ω (a constant), s and t can and do vary though they have maximum and minimum values (as does everything in UET). 1: (c*)3 and of single dimension to single dimension 1 : c* (where c* is the space/time displacement rate of a causal impulse (Note 2)). Thus, s3 varies from a minimum value su3, the exact region occupied by an ultimate event, to a maximum value of s03 where s0 = c* su. In practice, when the direction of a force or velocity is known, we only need bother about the ‘Space/Time Event Rectangle’ st = constant but we should not forget that this is only a matter of convenience : the ‘event capsule’ cannot be decomposed and always exists in four dimensions (possibly more). Movement and ‘speed’ in UET If by ‘movement’ we mean change, then obviously there is movement on the physical level unless all our senses are in error. If, however, by ‘movement’ we are to understand ‘continuous motion of an otherwise unchanging entity’, then, in UET, there is no movement. Instead there is succession : one event-capsule is succeeded by another with the same dimensions. The idea of ‘continuous motion’ is thus thrown into the trash-can along with the notion of ‘infinity’ with which it has been fatally associated because of the conceptual underpinning of the Calculus. It is admittedly difficult to avoid reverting to traditional science-speak from time to time but I repeat that, strictly speaking, in UET there is no ‘velocity’ in the usual sense : instead there is a ‘space/time ratio’ which may remain constant, as in a ‘regular event-chain, or may change, as in the case of an ‘irregular (accelerated) event-chain. For the moment we will restrict ourselves to considering only regular event-chains and, amongst regular event-chains, only those with a 1/1 reappearance rate, i.e. when one or more constituent ultimate event recurs at each ksana. An event-chain is a bonded sequence of events which in its simplest form is simply a single repeating ultimate event. We associate with every event-chain an ‘occupied region’ of the Locality constituted by the successive ‘event-capsules’. This region is always increasing since, at any ksana, any ‘previous spots’ occupied by members of the chain remain occupied (cannot be emptied). This is an important feature of UET and depends on the Axiom of Irreversibility which says that once an event has occurrence on the Locality there is no way it can be removed from the Locality or altered in any way. This property of ‘irreversible occurrence’ is, if you like, the equivalent of entropy in UET since it is a quantity that can only increase ‘with time’. So, if we have two regular event-chains, a and d , each with the same 1/1 re-appearance rhythm, and which emanate from the same spot (or from two adjacent spots), they define a ‘Causal Four-Dimensional Parallelipod’ which increases in volume at each ksana. The two event-chains can be represented as two columns, one strictly vertical, the other slanting, since we only need to concern ourselves with the growing Space-Time Rectangle. The two bold dotted lines (black and red) thus define the limits of the ‘occupied region’ of the Locality, although these ‘guard-lines’ of ultimate events standing there like sentinels are not capable of preventing other events from occurring within the region whose extreme limits they define. Possible emplacements for ultimate events not belonging to these two chains are marked by grey points. The red dotted line may be viewed as displacing itself by so many spaces to the right at each ksana (relative to the vertical column). If we consider the vertical distance from bold black dot to dot to represent t0 , the ‘length’ of a single ksana (the smallest possible temporal interval), and the distance between neighbouring dots in a single row to be s­0 then, if there are v spaces in a row (numbered 0, 1,2…..v) we have a Space/Time Event Rectangle of v s­0 × 1 t­0 , the ‘Space/time ratio’ being v grid-spaces per ksana. There are thus v intervals, the same number as the label applied to the final event ─ though, if we include the very first spot, there are (v + 1) spots in all where ultimate events could have (had) occurrence. This number, since it applies to ultimate events and not to distances or forces or anything else, is absolute. A secondary meaning of v is : the ratio of ‘values of lateral spatial displacement’ compared to ‘vertical’ temporal displacement’. In the simplest case this ratio will be v : 1 where the ‘rest’ values s­0 and t­0 are understood. This is the nearest equivalent to ‘speed’ as most of you have come across it in physics books (or in everyday conversation). But, at the risk of seeming pedantic, I repeat that there are (at least) two significant differences between the meaning of v in UET and that of v in traditional physics. In UET, v is (1) strictly a static space/time ratio (when it is not just a number) and (2) it cannot ever take irrational values (except in one’s imagination). If we are dealing with event-chains with a 1/1 reapperance rate, v is a positive integer but the meaning can be intelligibly extended to include m/n where m, n are integers. Thus v = m/n spaces/ksana would mean that successive events in an event-chain are displaced laterally by m spaces every nth ksana. But, in contrast to ‘normal’ usage, there is no such thing as a displacement of m/n spaces per (single) ksana. For both the ‘elementary’ spatial interval, the ‘grid-space’, and the ksana are irreducible. One might suppose that the ‘distance’ from the 0th to the vth spot does not change ─ ‘v is v’ as it were. However, in UET, ‘distance’ is not an absolute but a variable quantity that depends on ‘speed’ ─ somewhat the reverse of how we see things in our everyday lives since we usually think of distances between spots as fixed but the time it takes to get from one spot to the other as variable. 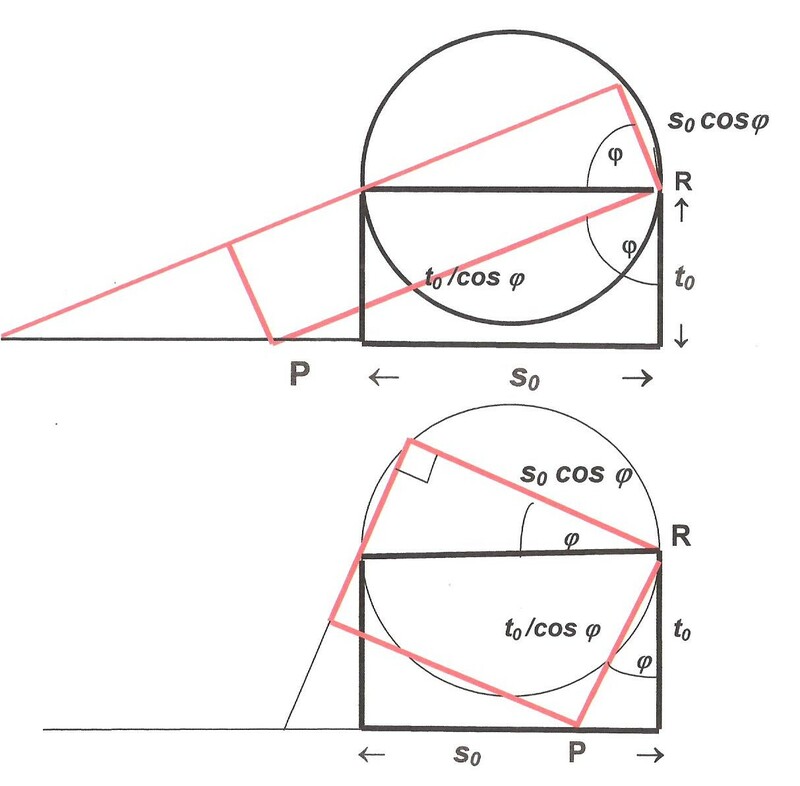 So we have s = s0 cos φ where φ ranges from 0 to the highest possible value that gives a non-zero length, in effect that value of φ for which cos φ = s0/c* = su . What is the relation of s to v ? If sv is the spacing associated with the ratio v , and dependent on it, we have sv = s0 cos φ and so sv /s0 = cos φ. So cos φ is the ‘shrink factor’ which, when applied to any distance reckoned in terms of s0, converts it by changing the spacing. The ‘distance’ between two spots on the Locality is composed of two parts. Firstly, there is the number of intermediate spots where ultimate events can/could have/had occurrence and this ‘Event-number’ does not change ever. Secondly, there is the spacing between these spots which has a minimum value su which is just the diameter of the exact spot where an ultimate event can occur, and s0 which is the diameter of the Event capsule and thus the maximum distance between one spot where an ultimate event can have occurrence and the nearest neighbouring spot. The spacing varies according to v and it is now incumbent on us to determine the ‘shrink factor’ in terms of v.
The spacing s is dependent on v so s = g(v) . It is inversely proportional to v since as v increases, the spacing is reduced while it is at a maximum when v = 0. One might make a first guess that the function will be of the form s = 1 – f(v)/h(c) where f(v) ranges from 0 to h(c) . The simplest such function is just s = (1 – v/c). 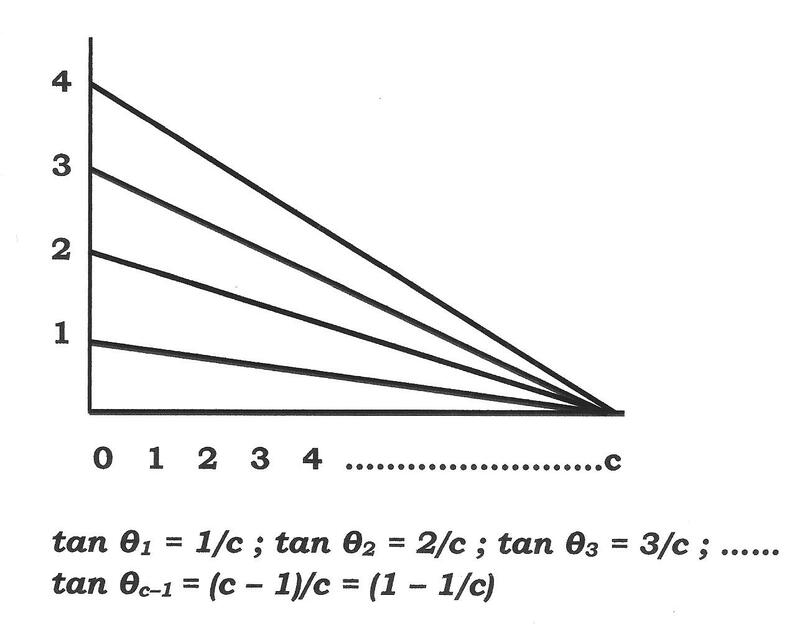 We thus have tan θ = n/c where n varies from 0 to c* = (c – 1) (since in UET a distinction is made between the highest attainable space/time displacement ratio and the lowest unattainable ratio c) . So 0 ≤ θ < π/4 ─ since tan π/4 = 1. 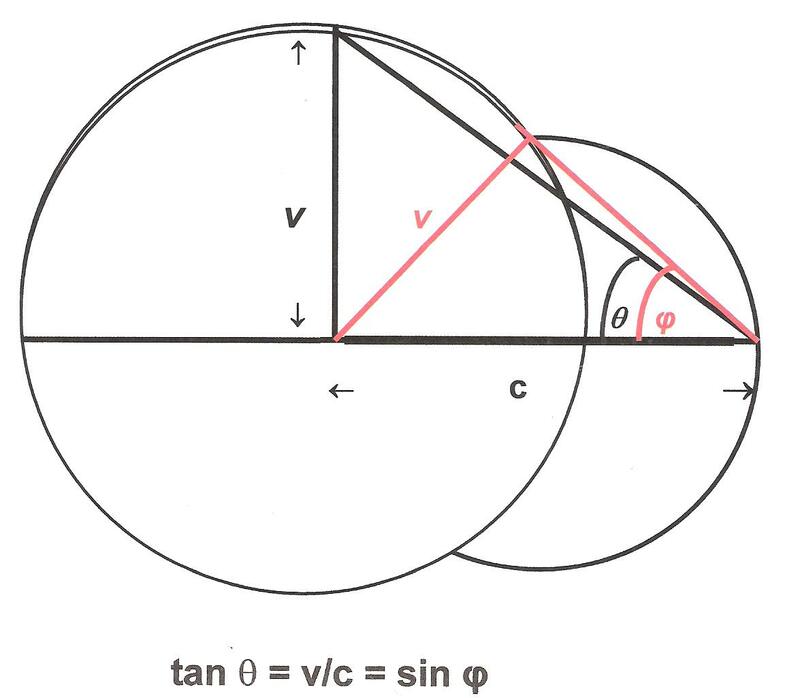 These are the only permissible values for tan θ . This is more complicated than our first guess, cos φ = (1 – (v/c), but it has the same desired features that it goes to cos φ = 1 as v goes to zero and has a maximum value when v approaches c.
As an illustration of what is at stake, consider two friends undertaking train journeys from a station which spans the frontier between two countries. The train will stop at exactly the same number of stations, say 10, and both friends are assured that the stations are ‘equally spaced’ along each line. The friends start at the same time in Grand Central Station but go to platforms which take passengers to places in different countries. In each journey there are to be exactly ten stops (including the final destination) of the same duration and the friends are assured that the two trains will be running at the ‘same’ constant speed. The two friends agree to stop at the respective tenth station along the respective lines and then relative to each other. The tracks are straight and close to the border so it is easy to compare the location of one station to another. This analogy is far from exact but makes the following point. On each journey, there are exactly the same number of stops, in this case 10, and both friends would agree on this. There is no question of a train in one country stopping at a station which did not exist for the friend in the other country. The trouble comes because of the spacing between stations which is not the same in the two countries, though at first sight it would appear to be because the same term is used. Is the contraction real? And, if so, why is the situation symmetrical? What is not covered in the train journey analogy is the symmetricality of the situation. But if the situation is symmetrical, how can there be any observed discrepancy? This is a question frequently asked by students and quite rightly so. The normal way of introducing Special Relativity does not, to my mind, satisfactorily answer the question. First of all, rest assured that the discrepancy really does exist : it is not a mathematical fiction invented by Einstein and passed off on the public by the powers that be. μ mesons from cosmic rays hitting the atmosphere get much farther than they ought to — some even get close to sea level before decaying. Distance contraction explains this and, as far as I know, no other theory does. From the point of view of UET, the μ meson is an event-chain and, from its inception to its ‘decay’, there is a finite number of constituent ultimate events. This number is absolute and has nothing to do with inertial frames or relative velocities or anything you like to mention. We, however, do not see these occurrences and cannot count the number of ultimate events — if we could there would be no need for Special Relativity or UET. What we do register, albeit somewhat unprecisely, is the first and last members of this (finite) chain : we consider that the μ meson ‘comes into existence’ at one spot and goes out of existence at another spot on the Locality (‘Space/Time’ if you like). These events are recognizable to us even though we are not moving in sync with the μ meson (or at rest compared to it). But, as for the distance between the first and last event, that is another matter. For the μ meson (and us if we were in sync with it) there would be a ‘rest distance’ counted in multiples of s0 (or su). But since we are not in sync with the meson, these distances are (from our point of view) contracted — but not from the meson’s ‘point of view’. We have thus to convert ‘his’ distances back into ours. Now, for the falling μ meson, the Earth is moving upwards at a speed close to that of light and so the Earth distances are contracted. If then the μ meson covers n units of distance in its own terms, this corresponds to rather more in our terms. The situation is somewhat like holding n strong dollars as against n debased dollars. Although the number of dollars remains the same, or could conceivably remain the same, what you can get with them is not the same : the strong dollars buy more essential goods and services. Thus, when converting back to our values we must increase the number. We find, then, that the meson has fallen much farther than expected though the number of ultimate events in its ‘life’ is exactly the same. We reckon, and must reckon, in our own distances which are debased compared to that of a rest event-chain. So the meson falls much farther than it would travel (longitudinally) in a laboratory. (If the meson were projected downwards in a laboratory there would be a comparable contraction.) This prediction of Special relativity has been confirmed innumerable times and constitutes the main argument in favour of its validity. Note 1 An ultimate event is, by definition, an event that cannot be further decomposed. To me, if something has occurrence, it must have occurrence somewhere, hence the necessity of an Event Locality, K0, whose function is, in the first instance, simply to provide a ‘place’ where ultimate events can have occurrence and, moreover, to stop them from merging. However, as time went on I found it more natural and plausible to consider an ultimate event, not as an entity in its own right, but rather as a sort of localized ‘distortion’ or ‘condensation’ of the Event Locality. Thus attention shifts from the ultimate event as primary entity to that of the Locality. There has been a similar shift in Relativity from concentration on isolated events and inertial systems (Special Relativity) to concentration on Space-Time itself. Einstein, though he pioneered the ‘particle/finitist’ approach ended up by believing that ‘matter’ was an illusion, simply being “that part of the [Space/Time] field where it is particularly intense”. Despite the failure of Einstein’s ‘Unified Field Theory’, this has, on the whole, been the dominant trend in cosmological thinking up to the present time. But today, Lee Smolin and others, reject the whole idea of ‘Space/Time’ as a bona fide entity and regard both Space and Time as no more than “relations between causal nodes”. This is a perfectly reasonable point of view which in its essentials goes back to Leibnitz, but I don’t personally find it either plausible or attractive. Newton differed from Leibnitz in that he emphatically believed in ‘absolute’ Space and Time and ‘absolute’ motion ─ although he accepted that we could not determine what was absolute and what was relative with current means (and perhaps never would be able to). Although I don’t use this terminology I am also convinced that there is a ‘backdrop’ or ‘event arena’ which ‘really exists’ and which does in effect provide ‘ultimate’ space/time units. Note 2. Does m have to be an integer? Since all ‘speeds’ are integral grid-space/ksana ratios, it would seem at first sight that m must be integral since c (or c*) is an exact number of grid-spaces per ksana and v = (c*/m). However, this is to neglect the matter of reappearance ratios. In a regular event-chain with a 1/1 reappearance ratio, m would have to be integral ─ and this is the simplified event-chain we are considering here. However, if a certain event-chain has a space/time ratio of 4/7 , i.e. there is a lateral displacement of 4 grid-spaces every 7 ksanas, this can be converted to an ‘ideal’ unitary rate of 4/7 sp/ks. In contemporary physics space and time are assumed to be continuous, so any sort of ‘speed’ is possible. However, in UET there is no such thing as a fractional unitary rate, e.g. 4/7th of a grid-space per ksana since grid-spaces cannot be chopped up into anything smaller. An ‘ideal’ fractional rate per ksana is intelligible but it does not correspond to anything that actually takes place. Also, although a rate of m/n is intelligible, all rates, whether simple or ideal, must be rational numbers ─ irrational numbers are man-made conventions that do not represent anything that can actually occur in the real world.